You must complete training with OGCA Pre-Award before you can receive write access to the proposal module. Contact OGCA Pre-Award staff for more information about training. If you need to have a proposal entry deleted, linked, or unlinked, please contact the UA Controller's Office. It is important to correctly use an existing S-number or create a new number as necessary due to the impact on official institutional reporting. When in doubt, please ask OGCA, since not all situations are the same! Create a new proposal with S-number in FRAPROP*. Follow the procedures outlined in the OGCA Banner FRAPROP Entry Guidelines. *Note: Do not create a new S-number for internal pilot project proposals associated with institutional capacity building funding. Create as a new proposal with S-number in FRAPROP, and mark the proposal type as "PP" for pre-proposal. If invited later to submit a full proposal, you will use the same S-number created for the pre-proposal and change the proposal type accordingly (NC, etc.). The first step to take is to verify how the sponsor will handle this request, as all sponsors treat them differently. To do this, contact your OGCA post-award analyst that handles the award. Do not automatically create a new S-number in FRAPROP unless it is first verified that this is necessary. Create only one S-number for for multi-year State of Alaska projects where a new RSA is issued each year. A separate G-number will be issued for each new RSA. Do not create a new proposal and S-number in FRAPROP. When continuation funds are received by the university, a new budget request may be required to be sent to OGCA. OGCA will make changes in the Banner grant module. All data originally entered in Banner proposal module remains the same. Continuations awards are made each funding cycle even though the original proposal/award was for multiple years. A progress report and budget request may be required to be sent to the sponsor each funding cycle. Check with your OGCA post-award analyst to verify. Renewals should normally follow the instructions for New Proposal above. IF the sponsor considers the renewal an amendment or modification to an existing award, discuss this with your OGCA post-award analyst before creating a new proposal and S-number. Update the current Banner FRAPROP entry. Do not create a new proposal and S-number in Banner. Do not update the proposal information in FRAPROP. All data originally entered in the Banner proposal module remains the same. OGCA will make changes in the Banner grants module. Each MAU should enter their respective piece and budget amount into FRAPROP, and the proposals should be linked (all non-lead portions should be linked to the parent proposal). No entry should reflect the total request for all MAUs. Each MAU should also use its respective F&A rate for their portion. Each MAU will have its own 'S' number. 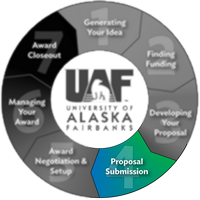 For proposals not associated with a parent award currently funded at UAF, create a new S-number in FRAPROP and treat as a new proposal. OGCA reviews these proposals before submission to the sponsor. Do not create a new S-number for internal proposals associated with a parent award currently funded at UAF. These usually take the form of pilot projects. OGCA reviews these proposals before submission to the sponsor.